This is the famous ‘Via dell’Amore‘. This path (number 2) starts near the railway station. On your left, as you exit the station, there is a flight of stairs and the ramp for those disabled. After a few steps one overlooks the rock-face plunging into the sea. Along the path one can admire various types of sandstones and wild vegetation such as the agaves, pitosforo, the prickly pear cacti, and the Hottentots (Carpobrotus acinaciformis, originally from South Africa), which have all adapted well to the proximity of the sea. While further up the hill the classic Mediterranean bush covers the rocks. The flight of seagulls and martins accompanies you on your walk. The last leg of the path is below terraced vineyards and overlooks Manarola’s railway station. To enter the village, one must walk beneath a 150 metre-long pedestrian tunnel, which has been decorated with frescoes, representing the Cinque Terre, executed by the pupils of the Academia di Brera under the supervision of Lino Marzulli. The height difference along the path is 30 metres…. 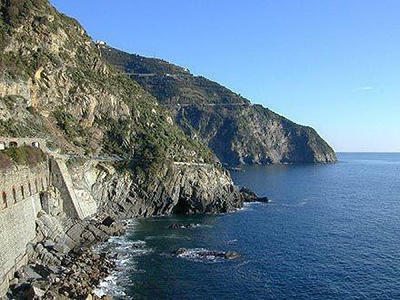 Trekking sui sentieri delle Cinque Terre con guida naturalistica!